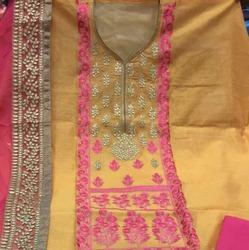 Our firm has gained recognition as the leading manufacturer, distributor, wholesaler, trader and supplier of a broad range of designer chanderi dress material . The suit offered by us are available in numerous colors, patterns & different styles by demand of customers. We are engaged in manufacturing of Chanderi Salwar Kameez which are beautifully designer according to the latest trend and girls choice. They are available at the most reasonable prices. Chanderi Salwar Kameez Catalog is 8 Pieces set , All 8 Pieces are to be sold at a time.